One of our most popular offerings, our 20’ portable office provides	easy, ground level access. Ideal for storing business records and valuable	equipment. Our new 20’ office unit provides an additional 160 square	feet of office space at your jobsite. Our new office containers come complete	with HVAC, fluorescent lighting (LED), hard wired external light with	an external GFCI receptacle. 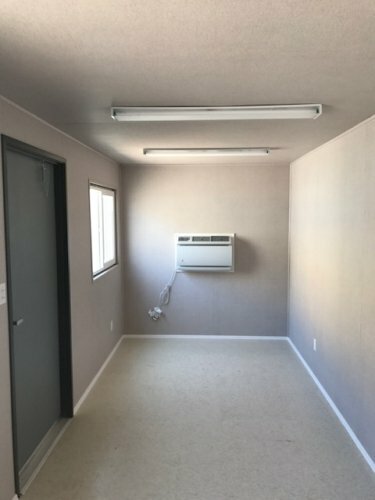 The R-13 insulated walls and ceiling assist	in providing year-round comfort. High security is greatly enhanced with	the security bars over the windows and the provided locking bar for over the door. Our 24’ Portable Office/Storage Combination units are the perfect	solution when both office and storage space are required. Step into one	of our Office/Storage containers, complete with air conditioning, fluorescent	lighting, plan table, and sliding window. This unit is built with an all	steel exterior including the double steel doors with our Sentry Locking	System to be open while office is in use and act as a high security barrier	when they’re closed. See dimensions below. We also offer a delivery service for our rentable office units, and that	coupled with our already low and affordable prices makes this one of the	top deals you will find! It’s our goal to provide you with the unit	you need so you can get your job done. Contact us today at (800) 786-3380 for your portable office unit.